Be the first to share your favorite memory, photo or story of Annie Dora. This memorial page is dedicated for family, friends and future generations to celebrate the life of their loved one. 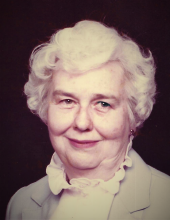 Annie Dora Wallace Frazier Scott, 92, widow of W. Dale Scott and Paul B. Frazier. Born February 23, 1926 in Serecta, North Carolina to the late Blannie and Tippie Katherine Summerlin Wallace. She was a member of Embrace United Methodist Church, formally Epworth United Methodist Church. Dora attended Women's College of North Carolina and later graduated from Eastern Kentucky University. She was a member of Methodist Women, Ladies' Circle, Sunday school teachers, and volunteered for Stephen's Ministries. She volunteered for various committees and community activities. Dora was retired from the Kentucky State Department of Human Resources, where she worked as a social worker. Dora is survived by her son, Michael W. (Hiromi Kuniyasu) Frazier of Knoxville, Tennessee, daughter, Tricia Frazier of Lexington, Kentucky, stepchildren, Martin (Barbara) Scott of Dayton, Ohio, Daniel (Elizabeth) Scott of Chantilly, Virginia, Paul (Lisa) Scott of Lexington, Kentucky, Carol E. Scott (Jim) Pinkston of Lexington, Kentucky, numerous grandchildren, great grandchildren, and great great grandchildren. She is also survived by her sister-in-law, Katherine Gaines of Sadieville, Kentucky. Dora was preceded in death by stepchildren, Ann, Susan, and Billy. To send flowers or a remembrance gift to the family of Annie Dora Wallace Frazier Scott, please visit our Tribute Store. "Email Address" would like to share the life celebration of Annie Dora Wallace Frazier Scott. Click on the "link" to go to share a favorite memory or leave a condolence message for the family.